Ministry of Social justice and Empowerment, Central govt. has made revisions in the previous “Dr. B.R Ambedkar Scheme for Social Integration through Inter Caste Marriage”. Subsequently, govt. will provide Rs 2.5 lakh to the couple in which either bride or bridegroom is Dalit. Moreover, govt. also removes the income ceiling of Rs 5 Lakh p.a. This is a positive move of the Modi govt. to open the scheme for all and to promote Inter Caste Marriage. This revision in the social integration scheme will tackle the problem of low response & approval rate. Moreover, Central govt. is going to spread awareness about the scheme even at the block levels. Modi govt. is relieving strict pre-conditions to put an end to caste system and endogamy (marriage within its own community). This Marriage scheme is for appraisal of the socially bold step and to help the couples in settling down in the initial phase of married life. Pre-condition to avail this scheme is that this is the first marriage of the couple. In addition to this, the marriage is registered under the Hindu Marriage Act and the couple should submit the proposal within 1 year. Now central govt. scraps the pre-condition that the total income of the newly married couple must not exceed Rs 5 lakh. Accordingly for now, there is no Condition / Ceiling of income limit to avail the benefits of this scheme. 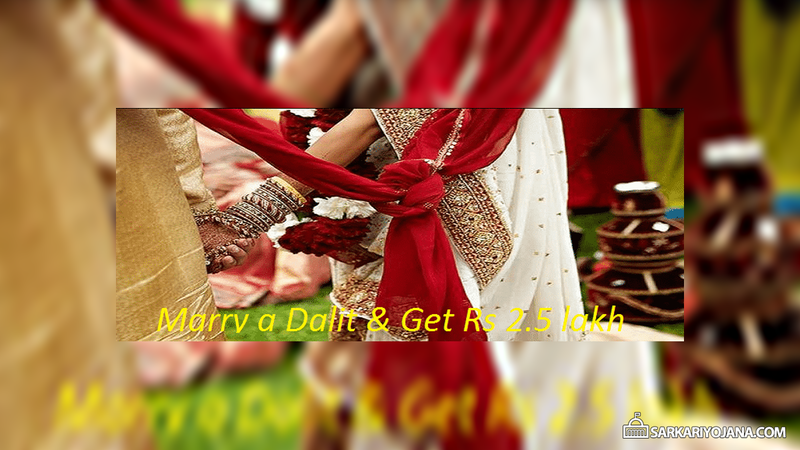 Subsequently, every couple in which any one of the bride or bridegroom is Dalit will now receive Rs 2.5 lakhs. They can receive this amount after submission of Aadhaar details and their joint bank account (Aadhaar linked) to the concerned Ministry. Furthermore, the target for each state is fixed in proportion to the Scheduled Castes (SC) residing in the states. However, states can exceed their limit while giving approval. Low Approval Rate – Central govt. makes this revisions to encourage inter caste marriages as the response to social integration scheme with previous provisions was poor. This schemes targets to provide benefits to around 500 couples per year. However, the number of beneficiaries were 5 in the year 2014-15, only 72 (out of 522) in 2015-16, 45 (out of 736) in 2016-17. Furthermore in the year 2017-18, social justice department has only approved 74 couples (out of 409) proposals. Strict Pre- Conditions – This low rate of approval is because the couples are not meeting all the pre-conditions. For example, only the couples whose marriage is solemnized under the Hindu Marriage Act are eligible. Lack of Awareness – The scheme awareness is very low at the block or district level. Most of the applications comes from a very few states such as Andhra Pradesh, Maharashtra and Telangana. Central govt. does not releases the data on the basis of caste in Socio-Economic and Caste Census. So, availability of Exact data of inter caste marriages in India is not available. As per the National Family Health Survey (NHFS-III) data, the rate of inter caste marriages in India is 11%. Accordingly in certain states like Jammu & Kashmir, Rajasthan, Chhattisgarh, Madhya Pradesh, Meghalaya and Tamil Nadu, approx. 95% of the total married couples marry within their own caste (Jati). Furthermore, other states such as Punjab, Sikkim, Goa and Kerala performs well with 80% couples marrying in their own caste. The Central govt. is making every possible effort to revive this scheme and to put an end to the traditional way of marriages on the grounds of Jatis (Caste) and Up-Jatis (Sub Caste). Pls give me all information about dr ambedkar foundation schemes. I am sc with mirage to st boy How apply The inter cast marriage online from. Which documents apply this schemes. Please may I know office address n contact no.? Or plz tell me online submission process n email id ? This is N. Rajesh Kumar from Erode, Tamil Nadu. My marriage was an Inter caste marriage and register under Hindu marriage act. I belongs to SC ( Adi Dravidar ) Caste and my Wife belongs to BC ( Kongu Vellalar ) Caste. Our marriage held on 09.11.2014, now only we came to know about Dr. Ambedkar Incentive Scheme for Inter-Cast Marriage. We have all the documents correct and will submit for your perusal on proposal for the incentive, shall we apply to avail the benefits now as we are under poor back ground. Kindly do the needful favour for our on going life it would be more helpful for us and Child.